Last Update Apr 2019 – What is Maguro? – the answer is pretty easy actually – it is the Japanese word for Tuna (ma –goo- rhoh) – highly sought after and in the world of sashimi it is served in 3 main grades. But before we get into the meaty bits lets go on a quick journey and have a look at some great Bluefin Maguro Sashimi in Osaka, Japan. This epic tuna tale (or tail) starts with a good friend of mine visiting me in Osaka for a slice of the raw fish action. 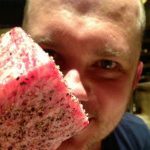 For those of you who have never heard the name Andy Fischtrom before – you really are not missing much, unless of course you are a fan of the Hobbit and Lord of the Rings movies in which he made a short appearance – but anyway enough rambling – lets get into the good stuff – the sashimi. Just behind Kyobashi Station in Osaka Japan there is a standing bar known to many of the locals as Maguro. It is run by an old man whose focus is on one thing and one thing only – serving some of the best Bluefin maguro sashimi ever. The place pumps – and with good reason, there are no chairs, you sometimes share tables and you get your own beers from a huge ice box out the front. The menu is scrawled in Japanese on a chalkboard and with the language barrier the place sees few international tourists but that just adds to the charm. It is an izakaya (Japanese eatery/ pub) with unusual trading hours but I guess if you are good at what you do, you really can open whenever you want and people will still come. We ordered a ‘maguro sashimi set’ which was offered in 3 types – the akami, chutoro or otoro. We were here for a good time so the otoro it was. this is the red meat that you are used to eating as sushi or sashimi, it is ‘normal’ tuna. 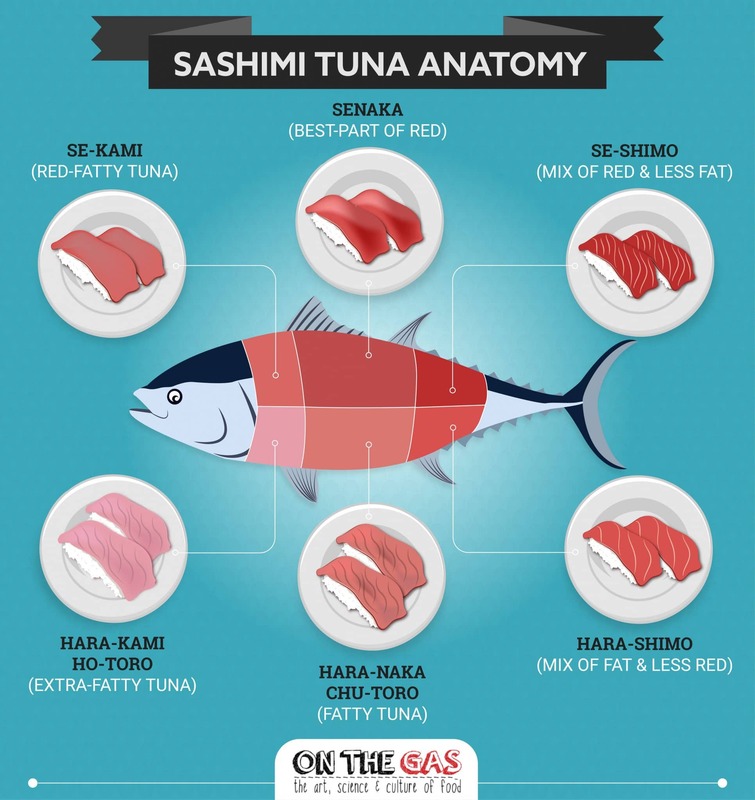 which is the fattier ‘belly’ part of the tuna and is further divided up into two parts. Part 1. Chutoro or chu-toro is medium fatty tuna – found next to the akami moving down towards the belly tip of the fish. Part 2. Otoro (o-toro) this is the fattiest part of the fish. It falls apart in your mouth and is heavy with Umami – needless to say it is ridiculously expensive. We also ordered a tray of fresh uni (sea urchin) which the chef lightly seared with a blow-torch as well as some Unagi (eel) and a bit of Tai (snapper). And then it arrived – the tuna looked more like a slice of marbled steak than a pieceof fish and once placed in your mouth there really was no reason to chew – just close your eyes and let it melt away. We ascended or descended into whatever heavenly state of unconsciousness was around that day and washed it down with cold Asahi. The uni was the perfect accompaniment for the gluttony mission on which we had embarked and the only thing that fell short of over the top awesomeness was the Tai – it was only good. If you are ever in Osaka and are feeling adventurous – Toyo Izakaya is just behind JR Kyobashi station. Head up past the bike parking between the JR and Keihan lines, turn left and go under the bridge – it is up the street about 50m or so on the left hand side – you will see people standing on the side of the street. Price – 3000 Yen and up – depending what you order. We had four large asahis and all the fish mentioned above including the otoro for Yen 14 000. Maguro is a threatened species and it was only until 2011 that they were successfully bred and raised in captivity. Kinki University in Wakayama now breeds Maguro successfully under the brand name of Kindai Maguro. Stay tuned because here at On The Gas we will be looking at them in more detail in the future. First paragraph – the word is “sought” not “sort”. It’s cool. Just a minor typo in an otherwise enjoyable article. Okay, one last small comment. And I know it’s difficult for folks who can’t roll their “R’s” – but it should be ‘mah – goo – rHoh”. Well spotted – thanks for that ! – all fixed now ..
Come back for another holiday – let’s do it again ! !